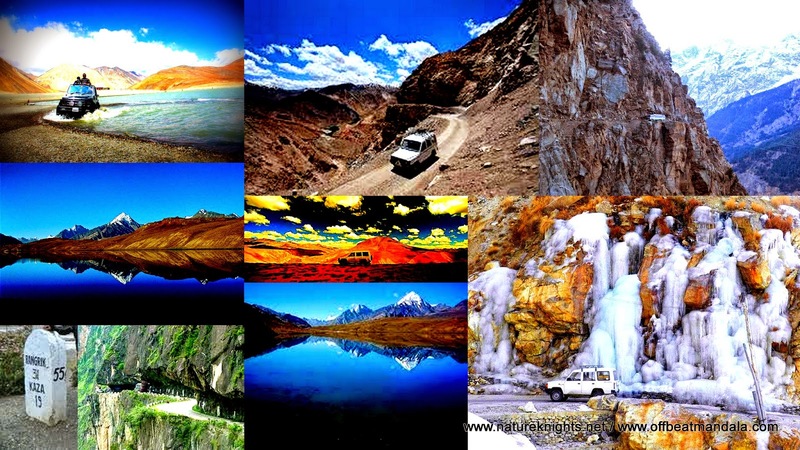 Experiences - Trans-Himalayan Jeep Safari through rugged regions in Lahaul Spiti; Camping in Offbeat Locations; (Mountains; Meadows; Lake Sides; and Above the tree line). Includes an overnight trek to mysterious and less explored place “Malana” where till 20 years ago entry was forbidden and even today this locality is a republic, governed by the local parliament called KORAM. Travel across the highest passes in the world during this offbeat Trans-Himalayan Safari. Read about Ladakh "The Land of Paradox"
Manali-Malana-Spiti-Ladakh Trip. (13 Nights and 14 Days) - 2 Weeks. Arrival Manali and transfer to Hotel. A day to explore Manali the queen of hill station. Our day start slowly after breakfast with a stroll from 500 years old wooden carved “hidimba Devi Temple”. 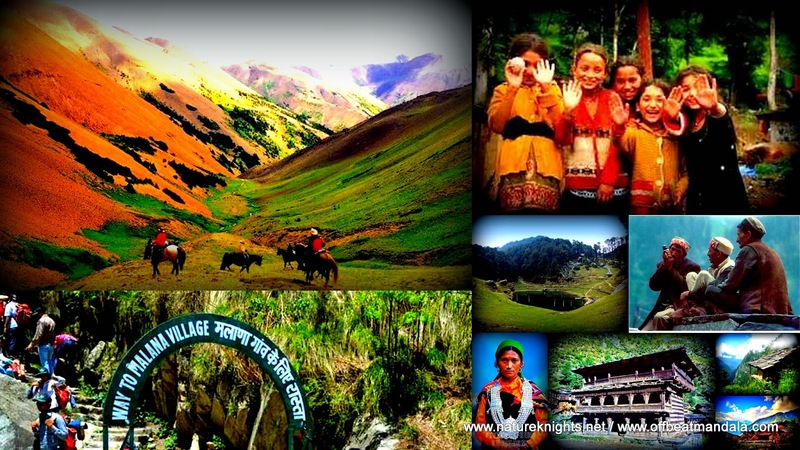 The stroll continue further to Old Manali village, which is known after the great hindu sage Manu. We further walk up to the next village of Goshal and cross our way through River Bias to a very spectacular water fall called Jogni fall. Next village is Vashisht , where you can enjot the hot sulpher in the springs,. If you feel tired of walking, take a tuk tuk ride to the down town. Free evening for own activities. Overnight hotel. Day 06): Kaza-Moon Lake (100km/4-5hrs) (Aug 27- Thu) Today drive to Chandratal Lake (4270mts). Reach chandratal and set up the camp. Evening free walk around the lake for Photography. Overnight Tents. Travel from Moonlake to Keylong and then drive to Jispa. driving over Rohtang Pass (3970 mts) which provides beautiful views of CB ranges, Pir Panjal range and Dholadhar range. En route visit several villages of Lahaul valley. On arrival check in at hotel. Overnight in Hotel. Travel by surface from Jispa to Leh over Baralachala Pass (4800 m). Lachang La (5065 m) and Tanglang La (5360m). On arrival check-in at Hotel . Overnight at Hotel. Full day excursion to Shey, Thiksey and Hemis Gompas. Shey Gompa lies on the way to Hemis. It is situated on the top of a hill and houses the largest victory stupa with a golden top. The statues made of copper and glided with gold are worth seeing. Thiksey Gompa lies on the left side of this road to Hemis. One can have a beautiful view of Indus Valley from the Gompa. Wall paintings of this Gompa are very interesting. From here drive to Hemis which is the oldest, wealthiest and largest Gompa in Leh with beautiful paintings stupas. Dinner overnight Hotel. After very early breakfast Drive to Pangong lake, the lake which is bounded with Tibet and India.. Evening back to Leh . Overnight Hotel. After very early breakfast transfer to Airport for catch the flight to Delhi. Or Drive to sarchu. Overnight Tents. (Flight ticket is not part of the package and will cost extra). 1) Plastic stays: It is one of the least degradable substances, resistant to the effects of the sun, wind and rain. When you leave a plastic bag or bottle in the quiet picnic spot that you and your family enjoyed, you may very well find it there when return a few years later, an ugly spot on the landscape. The State of "Himachal Pradesh" and "Jammu and Kashmir" has banned the used of polythene/plastic bags and you can be fined for using them, while you are in the Sate. conveniently placed dustbins. Don’t leave it lying around.